Amazing 2000 sq.ft 2 Level Penthouse W Private Roofdeck 1.5 Blocks to Beach! Treat yourself to the Penthouse By The Sea on your next vacation! We are in an A+ location just a block and a half to the Caribbean's best beach in Playa Del Carmen. Our building has a rooftop swimming pool with Caribbean breezes. This condo is one of only 4 Corner Penthouses in the building. We completely remodeled the condo in 2018 , see photos for detail. The exterior is Mayan Stone and the interior very modern Italian with open-air living space. This Penthouse is located just one block off the main street 5th Avenue (La Quinta), that has hundreds of restaurants, bars, shops, and boutiques. This penthouse is a SE corner home with floor to ceiling glass windows that let the warm ocean breezes flow through the wide-open living space. The chef's kitchen is outfitted with Italian cabinets, stainless appliances, granite, microwave, coffee maker, and all of the outfittings that your kitchen would have at home. The dining room has seating for 6 people. The main living room has all Italian designed furniture, flat screen television with Netflix & Hulu, and a wonderfully large balcony that wraps around the entire main floor with a bbq. There are two master suites, both with attached private full bathrooms. The master has a private balcony facing a rustic jungle paradise with exotic birds and butterflies. Both bedrooms have 400 thread count sheets and luxury linens. On the main floor is also a ½ bath and a full size washer / dryer. There are 3 new air conditioning units in the condo and ceiling fans in every room in the house. This amazing penthouse has a 1000 sq. 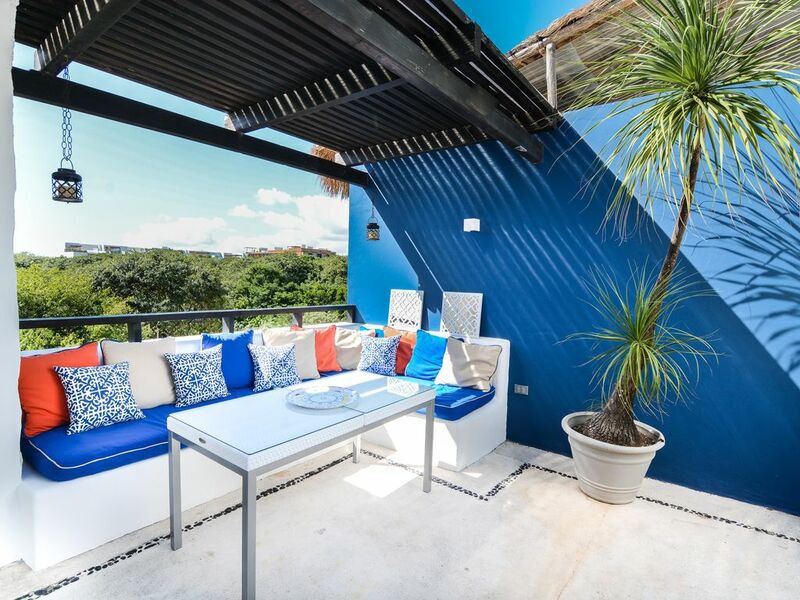 ft completely private roof-deck with 4 person jacuzzi, outdoor shower, ½ bath, wet bar with electricity for the blender to make margaritas, outdoor living room, & dining table for 6 people under our palaypa. You enter this private paradise through an interior staircase in the main living room. Our maid service comes once in the middle of each 5-7 day stay week, and is included in the rental price of this Penthouse. As well, the manger is just 5 minutes away and speaks English ( & French, Spanish, Dutch too) so that any and all needs you have can be met. There is one reserved parking spot in front of the building and security guards 24 hours a day at the main entrance of the building. Renting a car will give you the freedom to explore outside of the town. However, you do NOT need a car because you are however a 3 minute walk to the beach and to all of the restaurants on 5th Avenue. Just come down, breathe in the ocean air, and enjoy your relaxing vacation staying at Penthouse Coco Royal. Keywords: Penthouse Condominium, this is a top floor corner of a newly constructed modern building with a roof top swimming pool. This condo has 2 stories and over 2000 square feet of living space. It is just a 4 minute walk , 1.5 blocks to the sand of the beautiful beach in Playa Del Carmen. You cannot get much closer to the beach than this property. This is my second home in Mexico and my second property. I bought my 1st home in Mexico 17 years ago and fell in love with the town. I have been enjoying Playa and the amazing lifestyle here for 17 years, and I am a Permanent Mexican Resident. I have been renting my homes on VRBO for 15 years. For all of my guests I provide my owners tips for a great stay, insider knowledge of the hotspots, and secret spots to explore that most tourists don't know about. We are in a very residential part of Playa where it is quiet, and in the busy growing town of Playa it can be quite busy in allot of areas. However, EVERYTHING is just a 5 minute walk ( no car needed). This condo is one of only 4 penthouse corner condos in the building. Our location is fantstic because we are just a block and a half to the best beaches and a block and a half to the main walking street in Playa called 5TH Ave. There are more than 40 restaurants within a 10 minute walk from our condo! We have a huge table that seats 8 plus 3 at the island bar. 1000 SQUARE FOOT PRIVATE ROOF TOP DECK WITH OUTDOOR LIVING ROOM (SOFA & COFFEE TABLE, OUTDOOR SHOWER, PRIVATE JACUZZI FOR 4 PEOPLE, TABLE FOR 6 PEOPLE, WETBAR, AND COMMON SHARED POOL. Walk to beach and shops/restaurants etc. Good wifi. Clean and comfortable. Suited our family wonderfully! Thank you for the review & rental Theresa. You are welcome back anytime. Clean, spacious condo, home away from home. We very much enjoyed our month long stay. The condo was spacious and very clean, with excellent weekly maid service. Taty and Viviane were very quick with any minor repairs needed or inquiries we had. The security guards were wonderful to have 24 hours a day, and very friendly and helpful. The beach was only a block and 1/2 away, we used the services of the Martina beach club most days. Our daily walks from the condo down 5th Ave were great, where we enjoyed various delicious meals at several different restaurants. It is a easy 20 minute walk to Walmart or Mega store. Thanks for everything. Great for a family or two couples. Very clean, the upstairs patio was great to relax and eat breakfast or dinner. Location was toward the end of 5th Ave with some very good restaurants really close. Distance to the beach was about a 5 minute walk. Vivian - the local contact was super helpful and always available. She set up a tour and answered many questions we had during our stay. When they say its a Penthouse that's what you get... We spent a full week there after spending 7 days at the Hilton Royal all inclusive "Playa Del Carmen".. The penthouse was so relaxing... Perfect location to access the beach and 5th ave.. The beach at the end of the road is not busy, which we like.. Huge private deck is where we spent most of our time. The hot tub filled with cool water during the day and warm water in the evening with Shower and bathroom on the deck. Taty met us there and showed us around the Penthouse. "she was great".. Thanks Taty.. Vivian and Laura where more than accommodating over the phone and via emails.... Loved the modern Kitchen, 6 burner gas stove.. With 3 dbl beds and 4 bathrooms if you throw in the upper private deck bathroom.. We will bring family and or friends next time..We will be back that's for sure.. I recently returned from a fantastic stay in Laura's condo. Laura, Viviane, and Tati were extremely helpful before, during, and after our stay. Laura called in advance of our stay to share info about the condo, tips for our stay, and to see if there was anything we needed prior to our stay. Viviane, and Tati also contacted me to provide tips and assistance. They we're all great! I've stayed in PDC before, so I knew about the condo's location... it is great... a close walk to everything, but a quiet sanctuary when you want to get away from the activity downtown. There are a lot of great options for good healthy food very close to the condo. The condo is extremely well maintained and is very well appointed. The biggest surprise for me was.... just how big the unit is. The photos didn't fully convey how much space the condo offers. The two bedrooms are well separated and very comfortable. The roof top deck area was obviously one of the most attractive and enjoyable aspects of the unit, and we used it almost every day. The hot tub on the deck was great. I'll be honest... it isn't brand new, and there are some minor cosmetic signs of age... but it was in very good working order. This relates to one thing I'd like to share.. I wanted to make sure the tub was clean, so I packed some spa tub cleaner with me. When I used it virtually no dirt came out of the pipes... that's a very good sign of how well the tub, and Laura's unit in general, is maintained. Was there anything that wasn't great? Only a couple of REALLY minor things... 1) There is no elevator in the building, so don't over pack like I did. If you don't want to haul heavy luggage up stairs... pack light... remember you've got access to a washer and dryer in the unit ;-) and, 2) There was no access to TV/Netflix during our stay due to technical issues. Laura, Viviane, and Tati did try to resolve the issues... but they weren't able to. My advice is to download a selection of movies to your local devices in case you have a couple of rainy days like we did. Overall, it was an unbelievably enjoyable visit to a great condo in a great town! THANK YOU Laura, Viviane, and Tati !!!! My Wife and I rented the condo to celebrate our Honeymoon. The place was immaculate, beautifully decorated and perfectly located to enjoy all the fun Playa Del Carmen has to offer. The condo itself was amazing, from the penthouse deck to the beautifully furnished rooms and well stocked kitchen, no expense was spared. I have rented several properties on Home Away and VRBO in the past, but this experience was above and beyond all the rest. Laura was very attentive and has streamlined the process to be very user friendly well trusted. Laura is extremely well versed in all things "Playa" is was always just a phone call away through the booking process. She also has a wonderful staff of people waiting to assist you on the other end, once you arrive. We dealt with her assistant "Tatty" who was absolutely amazing. We arrived late in the evening after dark and had some trouble locating the property, but after one text to Tatty she drove right to our location and had us follow her to the condo. Now that is what I call service and was much appreciated. I would recommend this condo to any and all of my friends and family. Don't hesitate - rent it now, you wont be disappointed. Rates are subject to change until the property is booked. Cleaning Upon Check Out is FREE. Also -1 Cleaning is included in the middle of the stay for rentals of 7-10 nights. If extra cleanings are requested during your stay, then they will be billed at 300 pesos ($17usd) per extra cleaning. Owner will hold a security deposit separately from VRBO through the Paypal.com Deposit System. Any Guests over 4 will have a small fee added of $15 per night per guest to cover the extra laundry, utilities, & cleaning.